When you’re selling a home you’ll want to know the difference between real property and personal property. Not knowing actually what you can or can’t sell may cause you some grief in the long run and even worse end up in court. Proper planning and the knowledge to know the difference will make things easier for all parties in the end. As you get ready to sell your home you’ll want to have an idea of what if any items will be included in the sale. With all the technology out now, like flat screen TV’s and home automation, etc they may be required to be included depending on how these items are attached and should be considered part or not part of the sale of the home. More specifically, TV’s that are attached to the wall would be considered real property but are not usually something that would be assumed to be left behind, to save yourself the grief make sure you’re protected by putting your thoughts in writing in the listing and purchase contract. Home automation systems like alarm systems that are built into the home would be assumed by all parties to be included in the sale and like the TV’s if it’s not the intention of the seller to included it you must put it in writing. Another area that may cause some confusion is window coverings, items like curtains and blinds specifically may be an issue. Technically both are probably “attached” to the property so in theory they would be assumed to be included unless stated in writing. These items are sometimes a grey area though because the buyer many not necessarily want the sellers curtains and blinds so make sure again… everything is in writing. Real Property TIP: A good way to think of things is if it is attached to the property, specifically the ground and or structure then it’s assumed to stay with the house. Proper planning and having the knowledge to know the difference between real property and personal property will save you in the end. Always remember the real property tip above and that anything else that’s not attached, refrigerator, furniture, etc would be considered personal property and not therefore assumed to be in the sale of the property. There are a couple of items that don’t fall into either personal property and real property categories such as gas logs in a fireplace. Items like these are meant to enhance and be part of the property so again, if it’s your intention as a seller to keep these items, put it in writing. Of course everything is negotiable so also keep that in mind! As you’ve been reading the main points of this article is that you need to plan in advance and put your thoughts in writing if it falls into a grey area. Likewise its important to remember that if as a seller you have to unscrew, detach or uproot something from the interior or exterior of the property then you’re probably talking about a real property item so be careful. If you’re unsure about an item please contact your favorite real estate agent, most likely they’ll be happy to provide a simple walk through on the property with you. 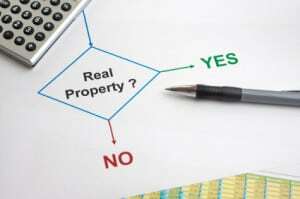 For more information on real property and personal property please contact us or leave a comment below. We’d appreciate the opportunity to assist you!